Comfort amidst wilderness! 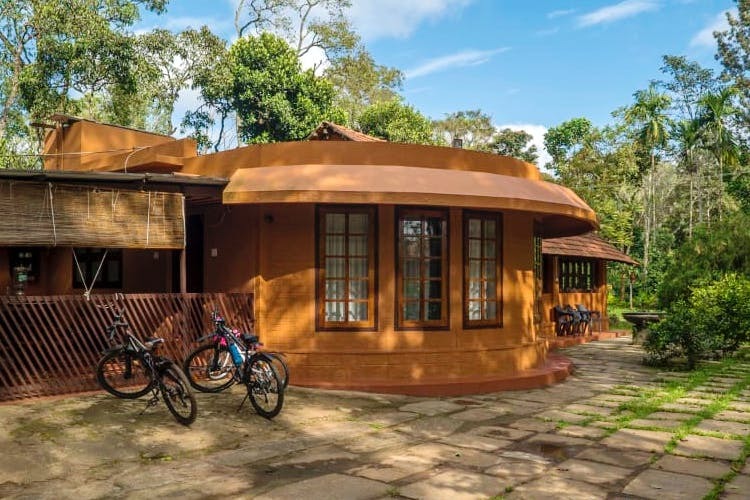 Nestled between the coffee plantations in Coorg, Brindavan homestay has it all – refreshing environment to exciting activities. All you need to do is tell us about your favourite getaway, and you can win a stay here! Surrounded by a forty acre coffee plantation, Brindavan homestay offers a rustic holiday like no other. The earthy paints, lush gardens and natural pool add to the country vibe that already dominates the place. Experience a perfect holiday in the wilderness without having to compromise on the modern amenities as well. This tastefully decorated homestay with its modern rooms, elegant decor, and windows opening out to the beautiful views is the best example of comfort in the wild. The whole place is large enough to host about 15 people, so whether it’s that much-delayed family gathering, or that quick getaway with the whole gang of friends for a weekend getaway, this place has you sorted. What is also like is that it is fuss free but classy. Just like a typical Coorg home, that is always open to guests. After all, the folks from this area are known for their outstanding hospitality, and wonderfully kept homes. You can choose to explore the plantation by foot or sign up for mountain biking to add to the excitement. Or just cuddle up with your book on the porch or spend the afternoons in their swimming pool. The possibilities are endless. Oh, and did we mention the place is pet-friendly? Yup, it is. No need to worry about leaving behind your real BFF. Take along doggo, and we can imagine that the pooch may just have more fun in the lush gardens and outdoors than even you perhaps! It’s pretty simple – you just have to recommend the best getaway from your city with the hashtag #GetLost. All featured posts with this hashtag can avail a 12 per cent on bookings at Wandertrails. The best recommendation wins two days and one night at this pretty cottage along with a friend. Your recommendation needs to be shared on your social media, tagging LBB and Wandertrails. The more unique and detailed your recommendation is, the higher are your chances of winning this. You and a friend could get a much-needed escape from the heat and chaos of Bangalore (and it helps that this place looks straight out of a fairytale). Post your favourite getaway here.